Today I’m going to give you a meal plan for weight loss. I’ll lay out, clear as day, what foods you should eat and when you should eat them. I’ll tell you which foods are your friends and expose those that are foes. I’m going to hand you my best kept fat loss secrets and share the worlds single most powerful meal plan for weight loss. All I ask of you? Pay close attention, don’t even blink. Read every syllable, every word, every sentence — no skimming around — there should be no room for misinterpretation. Short in stature and balding by nature, I’m a normal person just like you with fears and hopes and aspirations and needs. A sizable chunk of my youth was consumed with the goal “getting abs.” I wanted mine to pop like those on magazine covers and I dreamed of owning an impressive physique. Vain? Sure, but at least I’m honest. And after years of trial and error, I’m happy to say I achieved my goal and am fortunate enough to help others do the same. 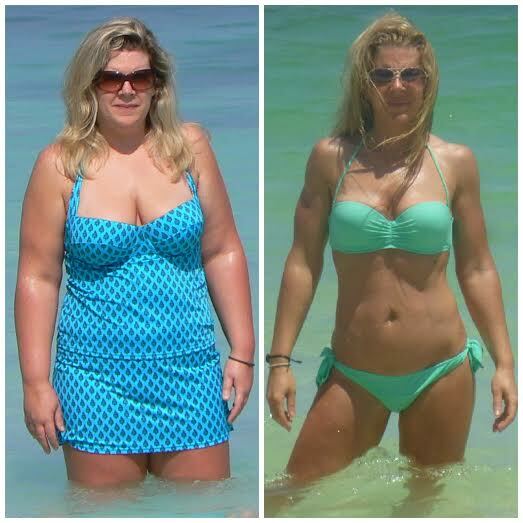 Kelly from Wisconsin, for example, joined my online coaching program nearly a year ago. She’s a strong woman, has a good head on her shoulders, follows my instructions to the “t,” and never misses a beat. 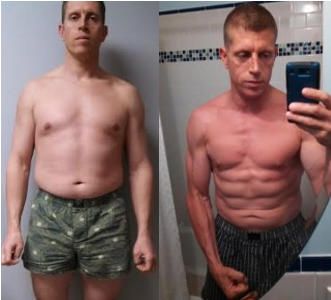 My client Jerry from Boston has been in my online coaching program for over a year and is a reckless practical joker. 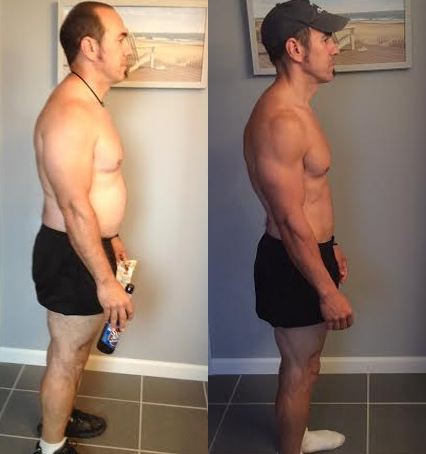 Yea, he’s holding beer and a bag of chips in his “before” picture on the left. 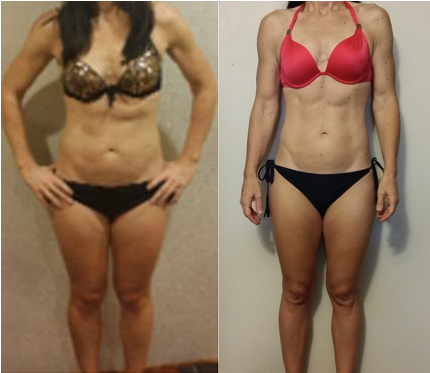 Lisa from Canada has worked with me online for more than two years now and, well, I think her picture speaks for itself. I show you these success stories not to impress you but to impress upon you what’s truly possible. Using the principles outlined in my meal plan for weight loss you’re going learn the truth about burning fat and how you can get the body you’ve always wanted. If you’d like to see more client success stories, CLICK HERE. 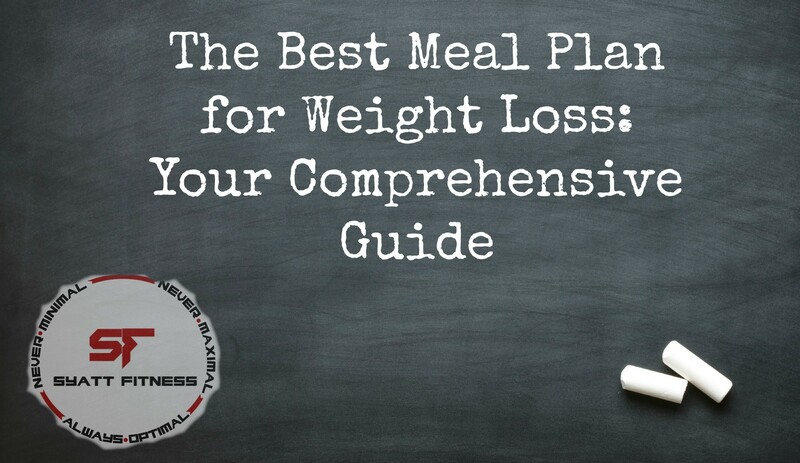 If you’re ready to examine the meal plan for weight loss, let’s begin. Which Foods Should You Eat & Avoid? Ironically, that’s also the main reason most meal plans fail. Let me explain. But first, just know that I’m about to tell you something that might make you think I’m deranged — which my ex girlfriends will happily confirm that I am — but hear me out, I promise there’s a method to my madness. There’s no such thing as a “good” food or “bad” food and there’s no such thing as a “fattening” food or “slimming” food. Lean in close and I’ll tell you why. Fat loss is a function of energy: more energy going into your body leads to weight gain; more energy going out of your body leads to weight loss. Simple as that. Now I’ll make it simpler. The fancy term for energy is “calories” and all food is made up of them. Apples and donuts and burgers and pairs, peas and potatoes and milk and bananas, all food has calories and all calories count. No matter how “healthy” or “clean” a food may be, no calories are exempt. If someone tells you calories don’t count so long as you eat healthy, they are sorely mistaken and you need only direct them HERE. 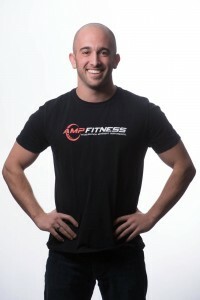 Allow me to introduce you to my online coaching client, Chris. We fixed him up straight away. Hesitant at first, but willing to try anything, Chris followed my instructions and counted his calories. His foods stayed the same so nothing changed there, but his portions were reduced and, well, look at his results. Erin has a similar story. 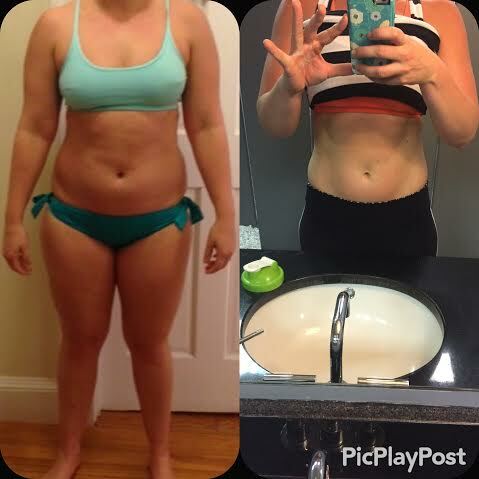 With a new focus on her calories and how much she was eating, Erin completely transformed her body. Stop. But What Foods Should You NEVER Eat? 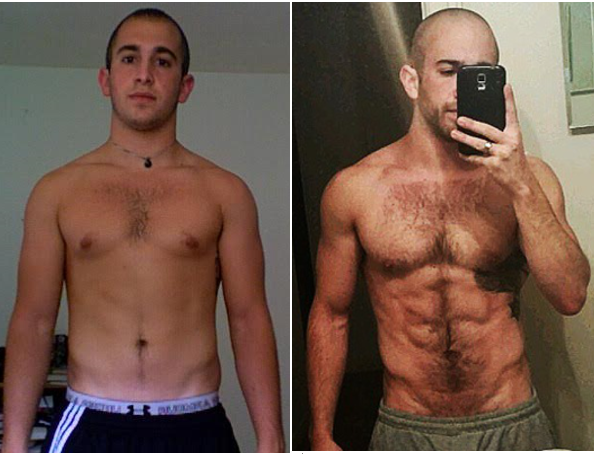 THIS guy lost 56lbs in 6-months eating nothing but McDonalds. And THIS professor lost 26lbs in 10-weeks eating nothing but twinkies. But these experiments demonstrate a very important point: there is no such thing as a “good” food or “bad” food or “fattening” food or “slimming” food. When it comes to weight loss calories are king. Period. Put differently, there isn’t a single food on the face of our planet that you must always avoid. So long as you keep your calories in check, no food will make you fat. 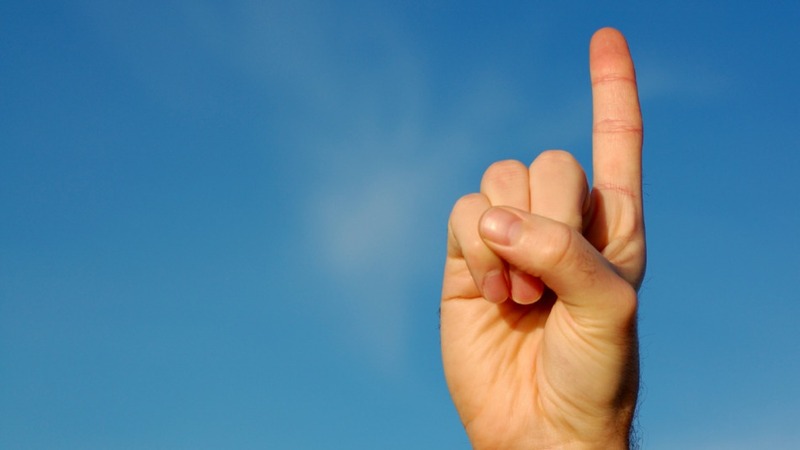 You’ll find a new answer lurking in every corner of the internet but few and far between are those that make sense. Now I have my own method of calculating calories and, as you’ve seen, it works very well. CLICK HERE and I’ll show you how it’s done. What Foods Should You Emphasize? 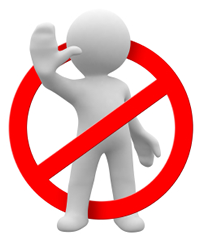 There isn’t a single food in the entire world that you need to avoid but there are foods you’d do well to emphasize. Not necessarily because they have some magical fat burning power or other mythical sorcery but simply because they make fat loss easier by reducing hunger and keeping you full. I’ve written about protein ad nauseam on this website and for good reason — it’s so damn important. Protein is the most filling of all macronutrients (protein, carbohydrates and fats). In other words, the more protein you have in your diet, the less hungry you’ll be throughout the day. Less hunger = better adherence. Protein has the highest “thermic effect of food”(TEF) which is an obnoxious way of saying in order for your body to digest protein it burns more calories than it does for equal amounts of carbohydrates or fat. In layman’s terms, the more protein you eat the more calories your body will naturally burn. Protein is the only macronutrient than can build and maintain muscle. And considering the more muscle you have the more calories you burn at rest, emphasizing protein will, in no uncertain terms, keep your metabolism “revved up” for longer. As for my favorite sources of protein…take your pick. And how much protein should you eat? Just about 1g of protein per pound of your current body weight every day. So if you weigh 150lbs, eat 150g of protein. It’s totally fine to go slightly over or under, but keep a consistent range between 0.7g – 1.3g per pound for the best results. Don’t feel like counting your protein? Make sure to eat at least a palm sized portion at every meal; that should do the trick. If you want to burn fat and keep it off for life, a major portion of your diet should include a variety of fruits and vegetables. My personal favorites are watermelon, strawberries, apples, oranges, cantaloupe, and melon as they’re all very low-calorie and incredibly filling. 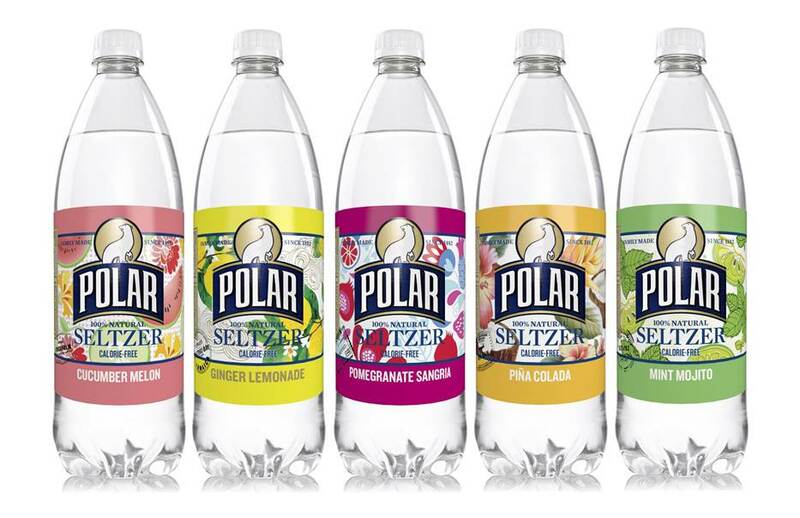 Water, coffee, tea, seltzer, diet soda, and all other zero-calorie drinks should be emphasized daily. The reasons are many but, long story short, they’ll keep you full at no caloric cost. Oh, and if you’re concerned about diet sodas being bad for you, READ THIS. Most meal plans provide you a list of times at which you’re allowed to eat. This is another reason why most meal plans fail. The truth is it doesn’t matter when you eat — all that matters is how much you eat. Regardless of whether you eat 6 meals/day or 3 meals/day or 10 meals/day or 1 meal/day, the time you eat is irrelevant. Remember, weight loss is a function of energy. And so long as you eat the right amount of calories it doesn’t matter how often you eat. Whenever works best for you. If you prefer eating small meals every 2-3 hours that’s perfectly fine. If you’d rather eat 3 larger meals spaced evenly throughout the day that’s great as well. It’s all about personal preference. Stick to a schedule that works best for you — not your roommate or sister or father or co-worker — and you’ll be far more successful. 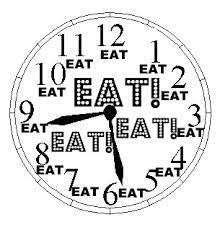 I should note: regardless of when you choose to eat, it’s often helpful to eat around the same time each day. Sticking to a consistent eating schedule regulates and normalizes your hunger hormones so, generally speaking, after 2-weeks of following a given schedule you’ll start to get hungry around the same times every day. So What is The Best Meal Plan for Weight Loss? The best meal plan is the one that allows you to make consistent progress without taking over your life. The one that makes your life happier, healthier, and more enjoyable. The one that you actually enjoy. And most importantly, the one you can stick to forever. That’s the key. Create a meal plan that fits sound nutrition into your lifestyle, not the other way around. Because the more you enjoy your meal plan the better you’re going to stick to it and the longer you’ll succeed. Want More Fat Loss Articles? You can join my VIP newsletter for free and have them sent directly to your inbox every week. Just sign-up HERE and I’ll send you an e-mail with a couple “welcome” gifts within the next 60-seconds.